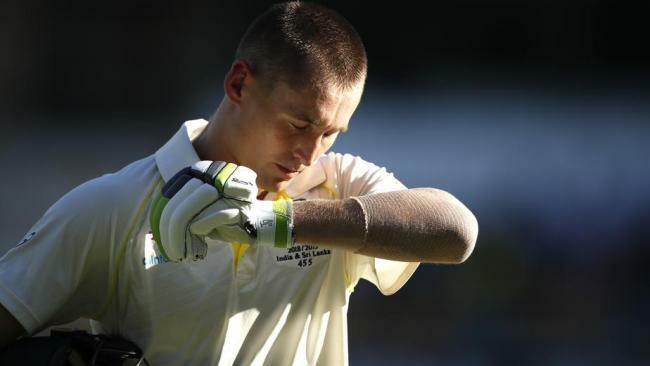 Marnus Labuschagne can't quite believe he blew his shot at a Test century. MARNUS Labuschagne and Travis Head have combined for Australia's biggest partnership in more than a year to put the hosts in a commanding position against Sri Lanka on the second evening of their pink-ball Test at the Gabba. Australia went to dinner at 5-249 on Friday in response to Sri Lanka's 144, with Labuschagne falling just 10 minutes before the break for 81. The pair's 166-run fifth-wicket stand also marked just Australia's second century-partnership of the summer and their biggest since last year's Sydney Test to help build a lead of 105. Head was not out on 71 with debutant Kurtis Patterson yet to score, after Labuschagne fell painfully short of his maiden Test century when he pushed a ball from spinner Dhananjaya de Silva to short mid on. It came after he had looked so comfortable against the spin in what was Australia's highest individual total of the summer, with all three of his boundaries coming against the tweakers. He swept well and brought up his maiden Test half-century when he cut Dilruwan Perera to the boundary early in the evening session. Coming to the wicket with the hosts in trouble at 4-82 after Marcus Harris and nightwatchman Nathan Lyon went in the first four overs of the day, Head and Labuschagne started slowly but fought hard for control. 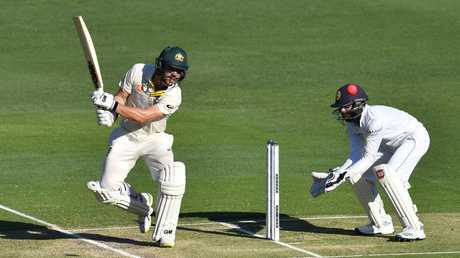 Head was dominant through the offside, hitting nine boundaries in his knock as he pushed to convert his fourth Test half-century into triple figures. Sri Lanka did have their chances to dismiss him though. 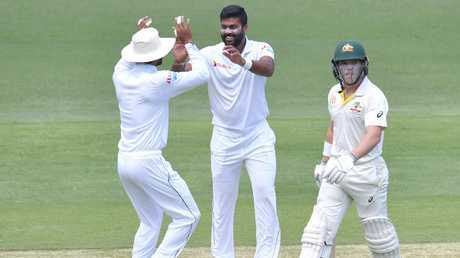 The South Australian slashed over the slips on just four from Dushmantha Chameera, while the same bowler had him edging behind on 29 only for the chance to be spilt by diving wicketkeeper Niroshan Dickwella. Earlier, Harris earlier blew his shot at a big score when he looked set on the opening night but bunted a short Lahiru Kumara ball straight to point in the first over of the day on 44. He has now passed 20 in all but one of his eight completed Test innings but is yet to convert a start into a century despite being Australia's best against India. Marcus Harris didn’t last on day two. Meanwhile, as Australia looked to build a first innings lead against Sri Lanka, South Africa captain Faf du Plessis couldn't resist a fresh taunt at his sandpapergate rivals. Responding to racial comments made by Pakistan captain Sarfraz Ahmed during the recent ODI in Durban, du Plessis said South Africa had accepted the touring skipper's apology. "We forgive him because he said sorry," du Plessis said after South Africa's training session on Friday. "He has apologised and taken responsibility for it. It is out of our hands and ICC will have to deal with it now." Sarfraz was caught on stump microphones taunting South Africa allrounder Andile Phehlukwayo with a racially charged comment, prompting match referee Ranjan Madugalle to report the incident to the ICC. Despite Sharfraz's abhorrent sledge, du Plessis couldn't help but make Australia the real bad guys. "We're a very gracious team. We forgive easily. Maybe not so much when it's Australia," du Plessis smirked at the end of the interview.